Interstate Specialty Products die cuts custom gaskets made of cast urethanes for applications that require resistance to abrasion, cracking, flexing, impact, tear, and heavy loads. 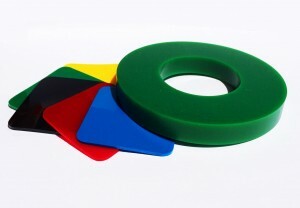 Examples of these strong but versatile materials include cast urethane sheets from PSI Urethanes, Inc. Die-cut urethane gaskets are available in a wide range of durometers, and remain stable under harsh environmental conditions. Cast urethane gaskets are available in formulations that are as soft as a marshmallow or as hard as a bowling ball. These die cut gaskets remain flexible at low temperatures, and can withstand sudden temperature decreases without cracking. They also remain stable at temperatures as high as 250° F, and won’t swell or deteriorate in water. Gaskets made of die cut urethanes also resist many oils, greases, and chemicals. Cast urethanes last longer than other materials when severe abrasion is a factor. Unlike conventional plastics, cast urethanes remain elastic. Unlike traditional elastomers, they remain resilient even in harder formulations. Die-cut gaskets made from cast urethane sheets also resist the cracking and hardening that’s associated with rubber and plastic. This allows the use of thinner sections to withstand repeated flexing. Die-cut urethane gaskets are ideal for critical wear applications, and can even outlast metal parts. For applications such as wear strips, formulations with a low coefficient of friction are available. 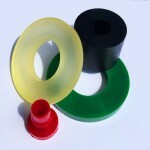 With their high load bearing capacity, die cut urethane parts are also ideal for wheels, couplings, machine mounts, and shock pads. For shock absorption, cast urethanes are available with a range of rebound values. Are cast urethane gaskets right for your most demanding applications? Interstate Specialty Products die cuts cast urethane sheets that are made without the use of any wax base, and that support bonding to metal, wood, and most plastics. Die-cut gaskets from Interstate meet tight tolerances, too. 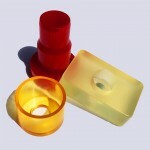 To learn more about cast urethane die cutting for custom gaskets, contact us on-line or call (800) 984-1811.